Tanja Berlin has provided some thoughtful options for Valentine’s Day. Tanja has generously allowed us to share the information from her website, Berlin Embroidery Designs, where she explains her idea to stitch a heart to help a friend by designing and stitching a broken heart. Tanja also provides a "whole heart" option, too. You'll see the heart she stitched to commemorate her 15th wedding anniversary. 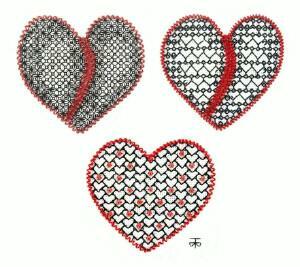 Check out the free blackwork heart patterns and the excellent, and very thorough, instructions. On that page, you'll find the link to the PDF instructions and patterns in blue, just below the image of the heart framed in red. While you’re there take a few minutes to look around. Tanja generously provides a number of free patterns in a variety of techniques and her Intermediate Needle Painting On-line Class “Red Fox” is calling my name! Tanja's designs are wonderful - I love the two-sided holly!